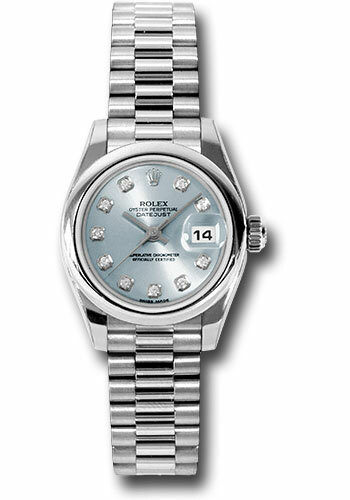 26mm platinum case, domed bezel, glacier blue dial, diamond hour markers, and platinum President bracelet. 26mm platinum case, domed bezel, glacier blue dial, Roman numerals, and platinum President bracelet. 26mm platinum case, domed bezel, lugs set with 24 diamonds, glacier blue dial, diamond hour markers, and platinum President bracelet. 26mm platinum case, domed bezel, lugs set with 24 diamonds, glacier blue dial, Roman numerals, and platinum President bracelet.